Focus on Adoption can tell your adoption story. Focus on Adoption provides an experienced perspective on current trends and issues in adoption and the unique social and cultural circumstances that are shared by adoptive families. We welcome contributors whose work is lively, informative, accurate, authentic, and accessible. We strive to represent the spectrum of opinions, experiences, perspectives, and voices that make up the adoption community, from those that affirm and encourage to those that challenge and provoke. As Canada’s only adoption magazine, we emphasize Canadian stories and voices. Email Brianna at bbrashnyberg@bcadoption.com for more information or to send a pitch or submission. Please note that all photos must be accompanied by a media release waiver. Adopted Voice—600-750 words. We’re seeking submissions from adopted people for this regular column that highlights the importance of listening to and learning from adoptees. We’d love to hear from you! Q&A—900-1200 words. Are you a therapist, a lawyer, a medical professional, an advocate, or a highly experienced adoptive or foster parent? We welcome participation from people with focused expertise or experience in adoption-related areas for this interview-style feature where readers’ questions are answered. Aboriginal Focus—750-1200 words. We are seeking contributions on topics relevant to contemporary Aboriginal living; custom adoption and kinship care; culture, community, and history; and other issues that matter to Aboriginal families of all kinds. We’re particularly interested in contributions from Aboriginal writers. Perspectives—1250 words. This section talks about adoption from a particular cultural, historical, or geographical perspective, and can include a mixture of facts, research, personal experience, and perspectives. Examples: Adoption in Japan, Adoption in Inuit culture, custom adoption. Feature Family—1250 words. In each issue, we profile an adoptive family and explore what makes them unique. If your family is interested in being featured, please contact us. We’d love to share your story! Opinion—500-750 words. Get on your soapbox! This is your chance to share your opinion on a current issue in the world of adoption. Birth Family Matters—700-1250 words. We’re actively seeking content from first family members, including extended family. Book/film/other media reviews—500-750 words. There should be an adoption theme in the book or film you would like to review. We also welcome brief recommendations of all types of media (50 words max). Visual content. Submit your artwork, photograph, comic, or other creation. One page or less; MUST BE high resolution (at least 1 MB). Poetry—45 lines or less. Occasionally we feature an adoption-related poem. All styles welcome. In-depth pieces—1500 words. These articles draw on research and news sources and discuss current events, key topics, challenging ideas, and other issues of interest to the adoption community. Past topics have included adoption disruption, sexual abuse, large families, international open adoption, and adopting children with HIV. Other adoption stories—5000-1250 words. These pieces are more personal, narrative, or reflective. Do you have a humorous take on the unique challenges of adoptive families? Special insight into a particular adoption-related life experience? An unusual reunion story to share? We’ve the challenges of open adoption, what it’s like when your parents adopt more brothers and sisters, what not to say to an adoptive parent, and everything in between. We’d love to hear your story! Events—50 words. Submit your events for inclusion in our community event listings. 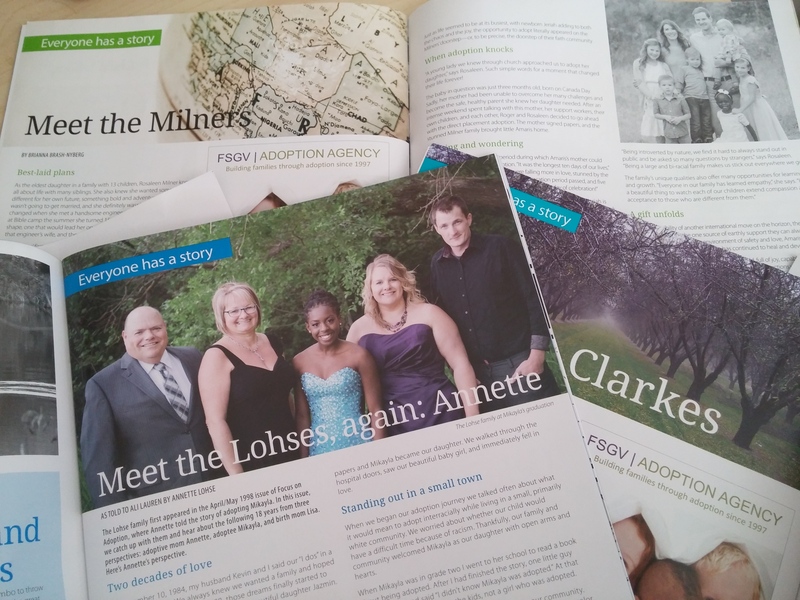 Browse articles from past issues of Focus on Adoption for a feel of our magazine.